Cowdray Golf Club are hosting a charity pro-am day in aid of St Wilfrid’s Hospice next Saturday (June 23). The event is widely acknowledged to be the biggest pro-am in Sussex, and will be an action-packed, fun-filled day for golfers, families and friends. Tim Allen, Cowdray’s director of golf, said: “Based on the success of last year’s event, administered by the South Region PGA, we are very much looking forward to hosting the Cowdray Pro-Am. The tournament is the centrepiece of our busy season. Teams of four, including one professional and three amateurs, will play 18 holes. The best two nett scores count on each hole. There will be fantastic prizes for professionals and amateurs including a chance to win an Audi A1 for a hole in one on the ninth hole courtesy of Harwoods and a golfing holiday to Portugal for the nearest the pin in two shots on the 18th hole thanks to Espiche Golf. Many people have worked very hard to co-ordinate this event and we are delighted to be raising funds for St Wilfrid’s, which is club captain’s Ken Chapman’s chosen charity for the year. This year Cowdray will be running two shotgun starts – the first at 9am and the second at 2.30pm. There are no more team spaces available, but spectators are welcome. Cowdray are delighted funds raised from this year’s pro am will be used to support St Wilfrid’s Hospice, which provides high-quality specialist palliative and end of life care in the community. Just over 100 women from across southern England attended Goodwood’s International Women’s Golf Day event, supporting Breast Cancer Awareness. The event was part of a global initiative to improve female participation in the sport and Goodwood’s day demonstrated how they are at the forefront of the movement. The club have more than 300 female members and are renowned for being very relaxed and breaking down some of the barriers associated with golf. On the Park course, an 18-hole pairs competition for experienced players with a handicap was won by Rosie Hoare and Marilyn Humphreys, while victory in the 11-hole Texas Scramble went to Shan Joshi, Katrina Poynton and Sally Amandini. For those less experienced, PGA Cup-winner and academy manager Chris McDonnell provided group taster sessions, teaching the basics of the game. Double Olympic gold medal-winning sailor and personal trainer Sarah Ayton was on hand to provide warm-up sessions for all the participants and talk about the fitness elements of playing golf. She said: “I’ve got a long way to go in golf, but I do it for pleasure and the kids and I play together. It’s something you can do as a family; I love the fresh air and you get a few steps in, so it keeps you nice and mobile and you make great friends. Free drinks completed the day and donations raised more than £575 for Breast Cancer Awareness. McDonnell said: “We had an incredible turn out for our International Women’s Golf Day event. All of the players had a fantastic time and those who were new to the game now seem keen to take up the sport, which is exactly what we are keen to encourage. “There was a great camaraderie between players of all levels and it proved how social golf can be. It was great to have the support of Georgia Hall and Sarah Ayton, who, in very different ways, are terrific ambassadors for the sport. Thanks to the hard work of the groundstaff, the Chichester GC courses are looking good and playing well and some exciting golf has been played over the past couple of weeks. The club have welcomed several new members, all of whom have joined the ladies competitions on Tuesdays and some at the weekends as well. Their division-one team continue to keep ahead of the rest with a good 6-1 win over Haywards Heath. The team comprised Kathy Donohoe, Sang Porter, Lisa Mitchelmore, Elaine Fell, Caroline Hawkes, Jennifer Sherwood and Helen Ball. The division-three team have also been making their mark and in their latest game beat Worthing 5-2 at home. 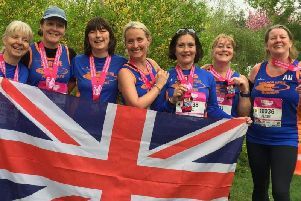 The team comprised Nicky Eastland, Rachael Hutchinson, Terry Payne, Lesly Hance, Val Swain, Jane Buckley and Wendy Jeffery. Other results: BB Stableford - 1 Jane Buckley, Yvonne Dunckley, Jackie Heard 68; 2 Nicky Eastland, Angela Perkins, Hannah Stephens 68. The weekend trophy was won by Helen Ball with 38 points and the runner-up was Kathy Donohoe on 37. Qualifying Stableford (Cathedral) - 1 Carol Stride 37; 2 Rachael Hutchinson 34; 3 Jane Buckley 34. Qualifying Stableford (Tower) - 1 Denise Lansley 38; 2 Liz Fraser 36; 3 Barbara Hastewell 35.